Have you ever been scrolling through Facebook or passing by a painted sign in a store and see a quote that just makes you stop and think? Sometimes quotes about money and life will make you nod your head. Sometimes they make you laugh. Sometimes they really hit home and motivate you to make a change. I’ve had several of these experiences over the years, and today, I want to share them with you. Think about what’s most important. Let go of what’s not. And strive to do your best and always be kind. This is one of my very favorite quotes about money because it is an important reminder that life is better without debt. Just because everyone is living in the moment now (and getting into debt) doesn’t mean you should. Be smart with your money now, and the rewards will more than pay off in the future. When it comes to paying down debt and saving money, it all starts with attitude. Once you learn how to get into the frugal mindset (where saving becomes a natural way of being) you will find yourself in a much better financial state. And when your finances are in order, you will find that you’re happier, too. 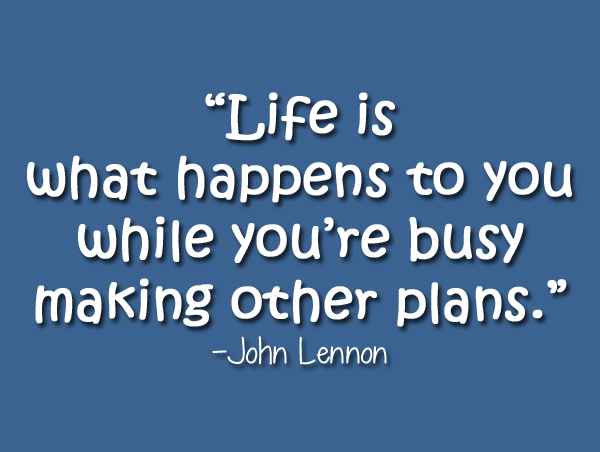 This quote from John Lennon is my reminder to try to be prepared for rainy days. Because the truth is that they always happen. I’ve learned that having an emergency fund in place is a very good way to take the stress out of stressful situations. It’s a lot easier to make decisions like whether to repair or replace something broken when you know you have good financial options available. When I first became a stay-at-home mom, I had a two-year-old and twin infants. Three kids in diapers. One income. It was hard. I had to learn how to do all kinds of money-saving things and sometimes, my attempts to save were complete failures. The important thing is that I didn’t give up. I made my mantra “All I can do is all I can do” and it helped me through many of those attempts at saving money. I’m better off for trying these things and figuring out what works and what doesn’t work for me and my family than if I’d never tried at all. Be brave. Try things. And try again. The things you learn from this process are invaluable. This is one of my favorite quotes to think about whenever I find myself getting jealous of others. Sometimes you just need to stop and take a good hard look at all the good in your life. Even if you don’t have fancy new things or much money in the bank, there is always something for which you are grateful. 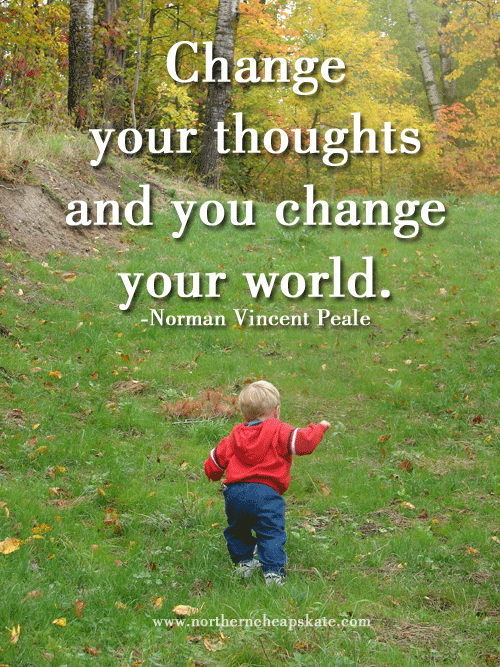 When we embrace this idea, life starts to look a lot better. These quotes about money and life are just the beginning of the inspiration you’ll find when you’re open to receiving it. 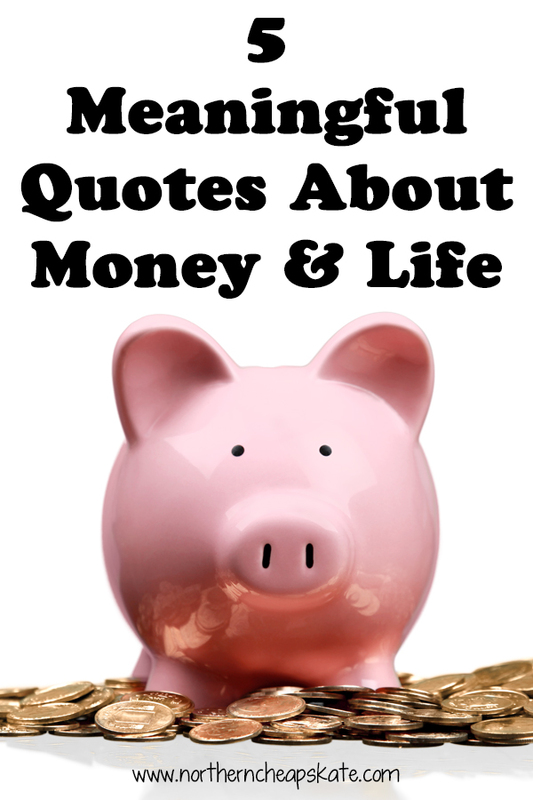 Your turn: Do you have a favorite quote about money and life? Share it in the comments! I’ve found gratitidue to fix most of my desires and wants into things I do not need. Traveling to third world countries will make you happy just to have clean water to drink. Makes everything else look unnecessary by comparison! I can see it that way, too. Especially within the context of the song. I just find myself thinking about this quote when good ol’ Murphy rears his ugly head. The thing I love about quotes is that they can mean different things to different people. The John Lennon one is a good reminder to me not to focus so much of my time on making money and other pursuits that I wake up one day and find that I’m 50, my kids are grown up, my most energetic years are behind me and I didn’t really take enough time out to enjoy or appreciate any of it. Great quotes and thanks for sharing!